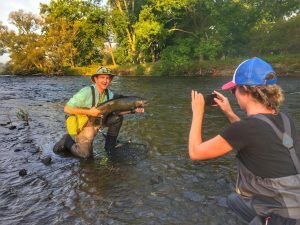 Amazing few days on the Douglaston Salmon Run, Salmon River, New York. 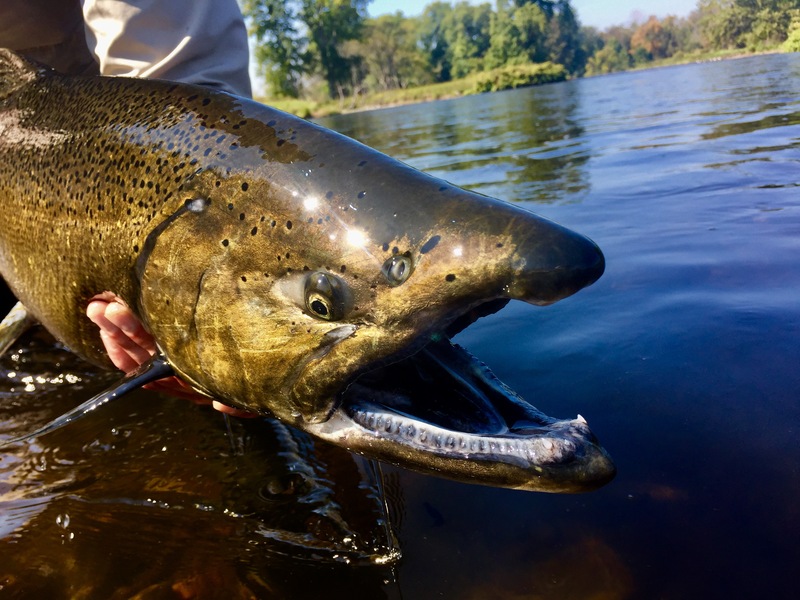 The Salmon River did not disappoint. It never has however, I admit I was more then a little worried about the weather/very warm temperatures. 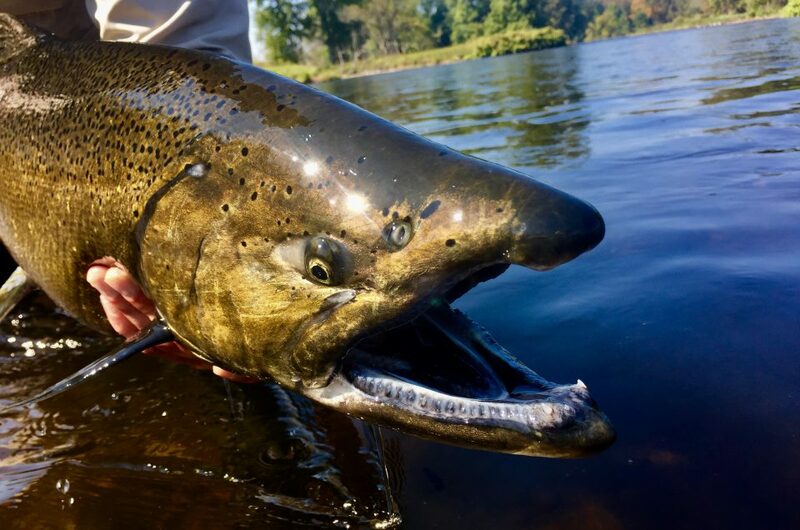 No one could even guess what impact the 80+ degree temperature would have on the salmon because the last time it was that warm during the days we would be fishing was 1937. 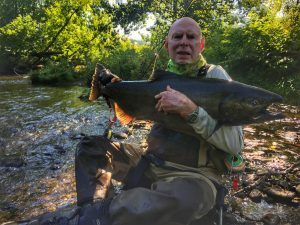 Turns out the salmon must not be able to get weather.com to load on their computers either. Am I the only one that thinks enough with the adds already? Okay, moving on. Outstanding fishing, absolutely outstanding. 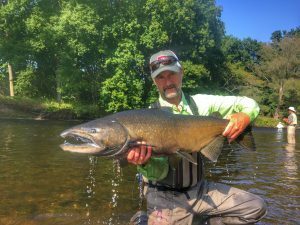 I’m always sure to let our first time anglers on this trip know, hooking king salmon is one thing, landing is whole different story. What an amazing group we had this year. Everyone had countless hookups every day and everyone landed fish. A couple of the anglers wanted to learn how to tie flies for the trip. 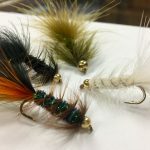 We love teaching people how to tie so, we sat down with them and went over the most effective patterns. Egg sucking leaches, sucker spawn, and egg patterns in a variety of colors. 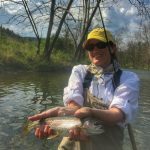 Hannah pictured above not only picked up tying like a pro, but she also caught on to casting, and fighting these monster fish like she’d been fly fishing her whole life even though she’s only been fly fishing for about 1 1/2 years. Congratulations Hannah. Great work to all anglers that joined us this year. Those were very hard fighting fish. 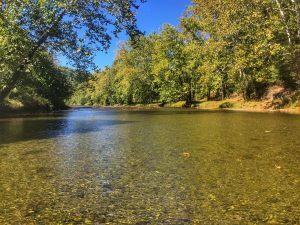 The cooler evenings and milder day temperatures are bringing us to the end of our smallmouth floats for the fall/winter. 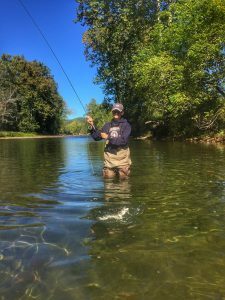 Smallmouth can be caught year round in Virginia however, we switch our focus to trout and musky during the cooler months. 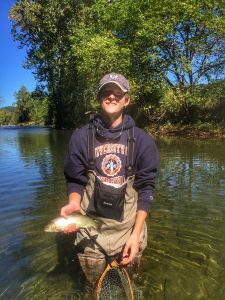 If you would like to continue to fish for smallies throughout the winter, fishing the deeper, slower moving water will produce some very nice size fish. Our trout rivers that have water in them are fishing very well. We are keeping figures crossed that we will get the rain that is forecasted. Most of our brook trout rivers are lower then I’ve ever seen. Some are even dry in areas when we normally see brookies spawning so, it goes without saying, we need rain. 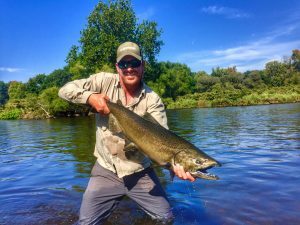 Big Bend Farm has been stocked and is fishing great. 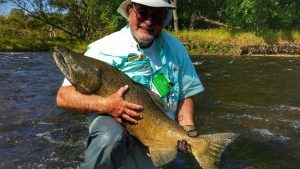 The water is on the low side which makes for very easy wading and unbelievable sight fishing. Caddis will start coming off in very large numbers any day. Right now wooly buggers in natural colors and a variety of nymphs are producing very well. Fall time at Big Bend it absolutely beautiful. I wish I had a musky photo to post but who doesn’t? I was able to get one day on the water to chase them after returning from the salmon trip. We did manage to convince two to eat. Didn’t manage to get either in the net. 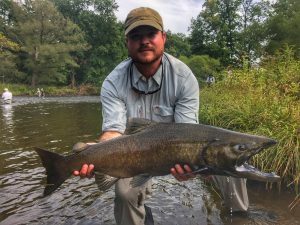 The James and Shenandoah are very low and clear making for some of the best sight fishing for musky you could ask for. I truly don’t know how many fish we saw 20+ and had at least a dozen follows. 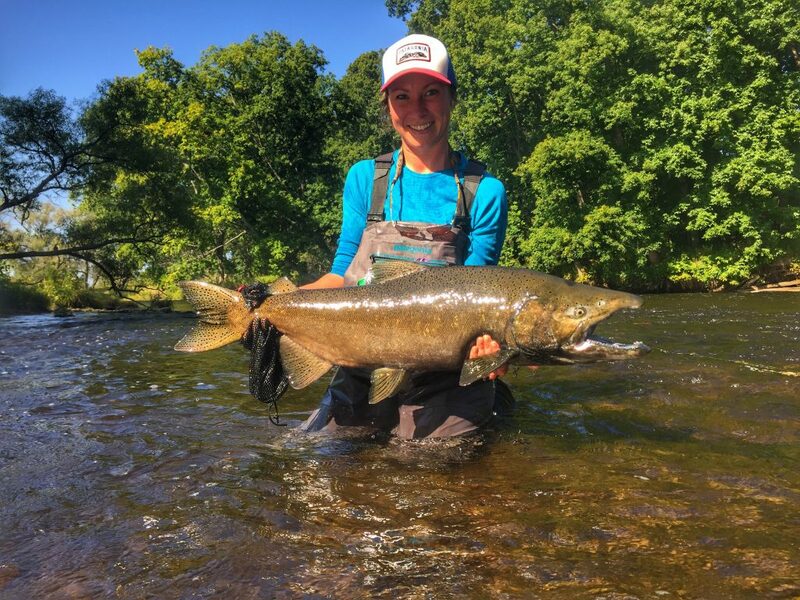 If you have been thinking about giving musky fishing a try? Now is the time.